Top picks for the best USA dude and guest ranch vacations for solo travelers–– men and women–– and when to go. If you’re a solo female traveler or venturing to a dude ranch on your own, you want to find a ranch where you feel comfortable, don’t have to pay a bundle for your own cabin or room and that perhaps has other adults with whom you can hang out. In surveying ranches across the USA for their accessibility for women travelers and solo adventurers, we found a lot of great options and some interesting information. Cowgirl Up at Bar W on Spencer Lake in Montana, a popular ranch for solo travelers. Many ranches welcome the majority of their solo women travelers during shoulder seasons (the weeks before and after the main season begins and ends), when prices are lower and less families tend visit because of school. These ranches often offer enticements for guests to come during this timeframe, including fall leaf peeping, adult only weeks, women-only getaways and special cattle drives and clinics. We’ve picked out ranches that welcome solo travelers year-round, as well as highlighted popular shoulder season options. Some ranches do charge a single suppment and we've highlighted ranches that help guests find a person with whom to share a room if they wish, as well as those who excuse the single supplement if the ranch isn't booked-- nice added perks. Check out these ranches across the USA that regularly welcome solo females and solo male adventurers. Have a ranch we’ve missed that you’d suggest? Email us or connect with us on Facebook or Twitter @Equitrekking and let us know. A year-round top pick for solo women travelers and solo men, this ranch’s Cowgirl Up, Photography Workshops, Cattle Drives and Adult Only weeks are particularly popular. Guests can enjoy winter rides in the snow and skiing in nearby Whitefish, another big draw. Read the full rundown. A luxury ranch vacation for solo women travelers, the most popular time of the year for single travelers to visit is spring and fall, when the ranch offers women-only weeks, special clinics and discounted rates. Read the full rundown. Top ranch for single female and male travelers, this working ranch gives an authentic experience with professional cowboys as instructors and has many solo travelers that return year after year. Read the full rundown. Top pick for solo women travelers! With over 90% of guests being solo women travelers, you’re sure to meet new friends on this equestrian vacation. Special themed weeks include riding during the Albuquerque Balloon Fiesta and yoga programs. Read the full rundown. Many solo travelers, including dads, moms, single gals and good friends of the Equitrekking team, visit Moore Ranch, a Southwest Kansas working ranch that takes only up to four guests. Read the full rundown. Top pick for solo women and men who are horse owners or regular riders with a special emphasis on building confidence in the saddle for novice or nervous riders. This ranch is also a hit with solo travelers coming from outside the USA and only charges a single supplement when the ranch is at capacity. Read the full rundown. 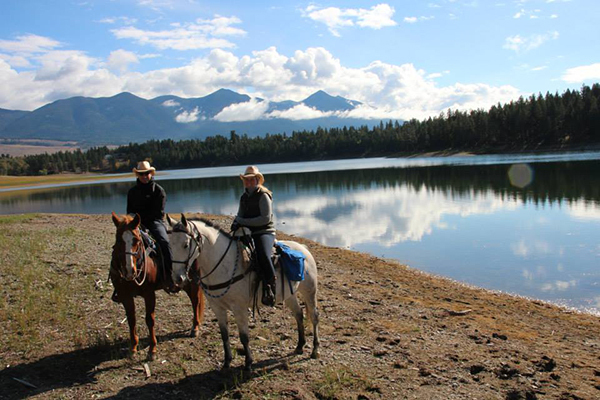 Top pick for solo women travelers with a special emphasis on natural horsemanship. An added perk, this ranch has a room specifically for solo travelers and will have a second in 2016. Read the full rundown. A family-focused ranch, the best time for solo travelers to visit is during special themed weeks, including the Great Grownup Getaway and the Cowgirl Roundup Girls Getaway. Read the full rundown. Top pick for solo travelers, male and female, this guest ranch has a high return rate of women traveling solo. Read the full rundown. This Colorado ranch has a family focus, but welcomes solo travelers and is run by a former Smith University graduate. Read the full rundown. Adult only weeks are the most popular time for solo travelers. This ranch is unique in that they do not charge a single supplement. Read the full rundown. Search Equitrekking's online guidebook for more great ranch vacations and Top20Ranches.com.